Register by clicking the image. Mr. Piñol is a practicing farmer, most qualified to head the Department of Agriculture. One of 11 sons of a farmer and a public school teacher from M’lang, North Cotabato, the Pinol brothers all know how to use a plow attached to a carabao to cultivate the land. He has bred his own line of native chicken using American strains and crossing them with the Philippines’ parawakan to produce a meaty and tender chicken breed. He is passionate with his goats and has champion breeds, too. His farm in Kidapawan also has peking ducks, carabaos, cats, even earthworms, which he produces in quantities. He plants moringa, (our lowly malunggay), lanzones, durian, rubber trees, turmeric and all other plants. His passion and love for his countrymen — making sure that food will be available and affordable for 105 million Filipinos, is reason why he traveled to America. Previously, he has embarked on his Biyaheng Bukid project, driving from the island of Mindanao and discovering the rich landscape of the Philippine islands, numbering to about 7,100. So far, he has covered 50 major islands? He has traveled to the highest peaks of the Philippines, Mt. Apo and Mt. Pulag, to discover for himself, the needs of the Filipino farmer. He will talk about the biodynamic farming methods of the mountain tribes of Ifugao, famous for the Banaue rice terraces and their unique heirloom rice. He will tell us about the rich bounties of the sea in Cebu, Leyte, Bohol, Zamboanga, Surigao and Antique, among many others. The Philippines has the fifth longest coastline in the world, much longer than the coastline of the US and China. He was also a former newspaperman, worked for Tempo as a deskman and sports columnist and erstwhile three-term governor and vice governor of North Cotabato. He shares the vision of the new President Duterte and his campaign pledge for the poor farmers. The message is clear this early: Corruption will be eliminated during his term as Secretary of Agriculture. The Philippines will try to be competitive in the world market and America stands to become a major ally. 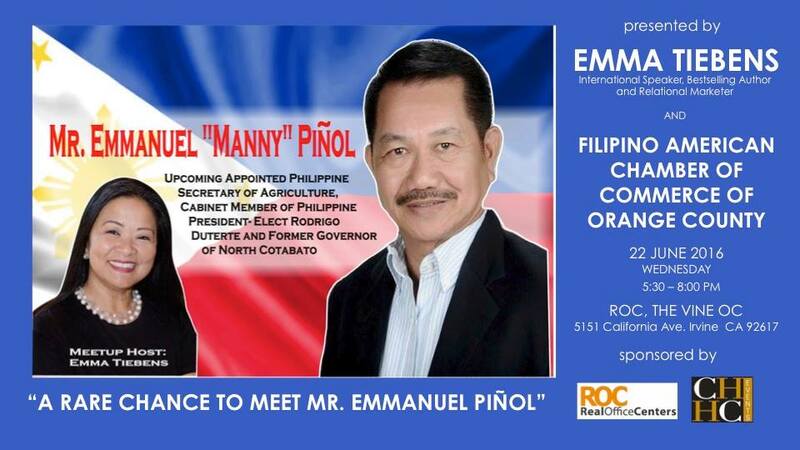 We are so thrilled to have Mr. Piñol to be our Guest Speaker for this month’s Meetup and he will be speaking about the state of Agriculture, Economy and Business and Investment Opportunities in the Philippines. If you are a Business Owner, Investor, Entrepreneur who is looking to expand your business in Asia, particularly in the Philippines, this is the perfect event for you! Limited Sponsorship Opportunities are available. Please contact info@emmatiebens.com . Come join us! RSVP here then REGISTER NOW by clicking on the link below. Seats are very limited and we expect a packed venue please CLICK BELOW REGISTER NOW!